You are here: Home » What’s New in Version 1.1? Maybe not many of you noticed, but we are rolling out bug fixes and feature additions at a race car pace. Take a look at our full changelog – we’ve released eight new versions since our launch two weeks ago. That’s pretty incredible progress. In the latest version 1.1 release, we added couple very useful features into the image category. These are commonly requested features from our early customers. We not only want to make them happy, we also want our future customers to enjoy them as soon as possible too. <img class="alignnone size-full wp-image-4314" title="me"
Second is image link support. If your image is already hyperlinked, you can now create, edit, and delete image links by clicking on the image and edit the link field. 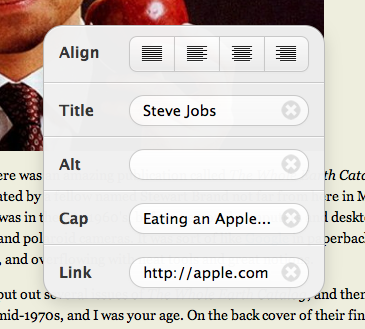 Artsy Editor will generate the image link HTML automatically. Last one is image ratio support. When you resize images from now on, you will notice the ratio will not change any more (which might cause disproportion images). The image, whether made larger or smaller, will have the same width/height ratio. Therefore they will look perfect regardless of size. You can update Artsy Editor by going to Plugins > Artsy Editor. Simply the Update button on the right sidebar and everything should be taken care of. 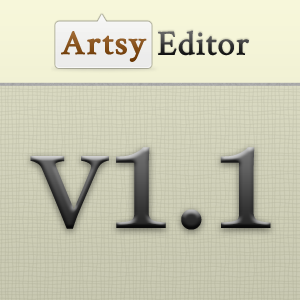 ← What Does WordPress 3.2 Mean for Artsy Editor? While there are many good aspects to this plugin I can’t quite see myself using it on my clients’ sites. Since the visual editor added a stylesheet it is now possible to have posts look the same in the back end as in the front end. This has been invaluable for new clients that seem to struggle with the most basic of tasks. The ability to have a consistent layout in the front and back end in invaluable to newbie clients.It would therefore be beneficial if the editor’s width could be adjusted to that of the post width set in the front end, such that I could say, have the post editor 600px wide for posts rather than the standard 800px. Even better would be a way of setting it so that I can have different width’s, so that you could have a 600px wide page or switch to a full width page at 900px wide.The main other style addition would be to have images styled in the back end – so that if the theme has set image padding/border etc this would show up in the back end editor.This would make it much easier for the new users who won’t end up struggling to position their images. All too often a client will craft their posts in the back end, only to find that when they preview the post in the front end an image is not positioned where they expected it to be. Thanks for the feedback. I agree with what you said regarding how content looks different in the front end and backend. We are actually planning a feature that will allow front end editing which is very convenient for newbie WordPress users. Is frontend editing available now?